Fulton Hogan has been repairing the roads of City of Port Phillip in Melbourne for 21 years, specialising in infrastructure maintenance, repair of potholes, roads and footpath reconstruction in particular. However, with this emphasis on road repairs, a better way of transporting asphalt was needed. 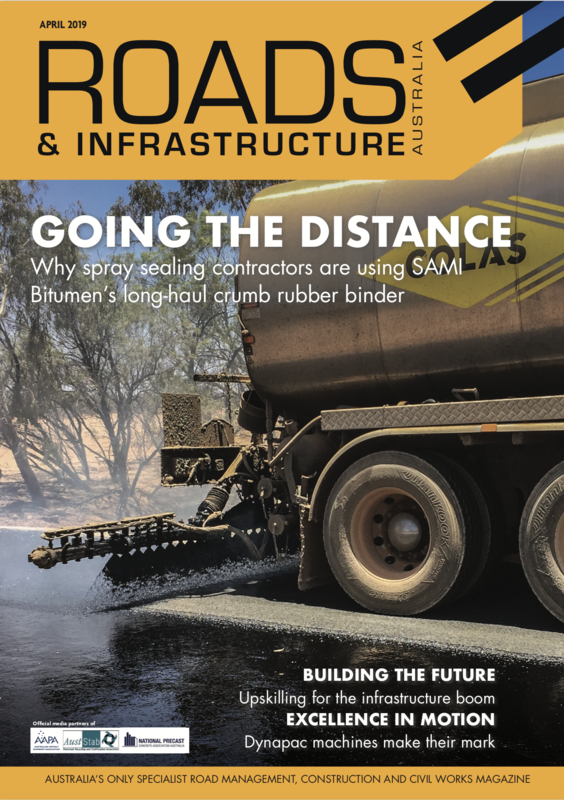 Nick Canton, Department Manager at Fulton Hogan, says there were many technical aspects to consider when choosing a new patching unit for the company’s operations in Melbourne’s south. “One major issue was that the traditional rigid patching unit bodies have cold spots in them where the wind hits it the most. They would start to lose heat over the day and we would lose product as it cooled down and hardened. Historically, the patching units we’ve used were heated by the exhaust system, which isn’t the most efficient way of handling things.” Mr. Canton says. The solution to these issues was the Trout River Australia five-metre Live Bottom Patching Unit. The Trout River unit is able to heat the floor, walls and emulsion tanks via heat trace elements. Mr. Canton says this system has allowed the asphalt to maintain up to 190 degrees Celsius and eliminates any cold patches. “We do a lot of pot hole repairs, so the heated truck body allows us to store the asphalt for longer periods of time. It helps keep temperature and allows us to maintain a quality product throughout the day,” he says. The live bottom patching unit means there is a significant increase in both safety and efficiency. The unit uses the conveyor belt system at the bottom of the truck to move product instead of relying on tipping, which helps avoid rollovers and height restrictions. Trout River’s unit gives better access for maintenance purposes by designing the conveyor belt to be easily removed. “This is really helpful as it means we can do all our maintenance at ground level. It removes all the hazards of sending people into the back of the truck and allows us to clean and maintain it all in one go,” Mr. Canton says. 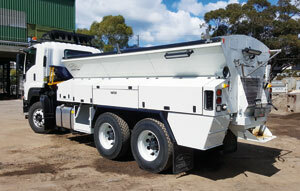 The increased carrying capacity of the 10-tonne unit gives Fulton Hogan a greater range of options. The enhanced capacity means the contractor can transport a much larger quantity of material over the day with minimal product waste. “The unit has enabled us to be more efficient with what we are doing and provide better service to our clientele. It’s a cost-effective method to deliver a higher quality product,” Mr. Canton says. Other features include insulation with aluminium dress bezels with the front, rear, sides and floor, Australian rated 6.2R, a hand lance and hose reel for hand spraying emulsion and product bins on each side at the rear of the truck with lockable storage on each side of the body. It also has a vibrating plate lifter, emulsion tank and 40-litre cutters tank for flushing the system. The Trout River unit incorporates a variety of safety features, including a sophisticated wheelbarrow mount on the truck. “The majority of the work is done by hand, usually fed by wheelbarrows. It’s important to make sure the wheelbarrows are kept locked down and safe. Wear and tear can be an issue with a lot of older rigid bodied trucks especially and can lead to hazards when driving on the highway.” Mr. Canton says. “On the Trout River unit there is a mount between the headboard and cab. There’s a hydraulic ram and wheelbarrow holder that locks it in place. Where it’s situated also means it’s completely secure.” Other safety measures include a multi camera system on the truck to help drivers get a good view of everything going on around them. Fulton Hogan has also installed additional LED lights to make night work safer for those involved. “A large portion of our work happens at night, so lighting is very important. With the increased amount of light that comes off the truck itself, it means we don’t need to carry as many light towers, and it makes it safer for workers to see and be seen at night,” Mr. Canton says. Fulton Hogan was able to modify the unit to fit its purposes, which he says has been a major contributing factor to its reliability. According to Mr. Canton, most patching units are used for transporting a dry material, so having the ability to work closely with Trout River to ensure they get the right system for the job was a significant benefit for the business.